© Mary Garner-Mitchell. “Objets de Barn Art” found mostly on site at Stagfield, c. 1781, Ashland, Virginia. While Friday’s storms had us somewhat consumed with cleanup (we were luckier than many), a pool and a shared bottle of Prosecco underscored a couple of delightful days that I want etched my memory as they otherwise held so few demands, despite downed limbs and buckets of sweat. Late yesterday afternoon, my friend Nancy Hugo windowsillarranging.blogspot.com/ invited us for a swim and happy Happy Hour that was the exclamation point ending to a weekend punctuated by what to me is “Summertime” – golf, gardening, grilled suppers, oppressive heat, wind-whipping thunderstorms, good friends, a good book, a good nap – and with Nancy and John, always good conversation. Which brings me to our discussion of “brown” and an ongoing thread that has woven itself through my ponderings these last few days, weeks, perhaps most of my collecting life! According to Nancy’s sources (her children and their peers), the generation just starting housekeeping eschews brown furniture – meaning the pieces handed down through at least the last three or more generations. They don’t want it and the antique and consignment shops are testament to this sad trend. It’s a real shame, for just as our parents and many in my demographic of Boomers are downsizing, this glut of apparently unappreciated, quality “brown furniture” has depressed prices to alarming levels. I have a house full of it! I’ve noticed even the preponderance of Pottery Barn is moving over for Mod, and while I appreciate aspects of most styles and love a mix, it pains me to see what I fear might be a lack of regard for the real patina of rich walnuts, mahogany, heart pine — in other words, BROWN! Which brings me in a round-about way to why I like rust. So, ANYWAY, today’s photo seems an appropriate way to illustrate my musings above and my love affair with all things old, rusty, worn, well-used, and well, brown! 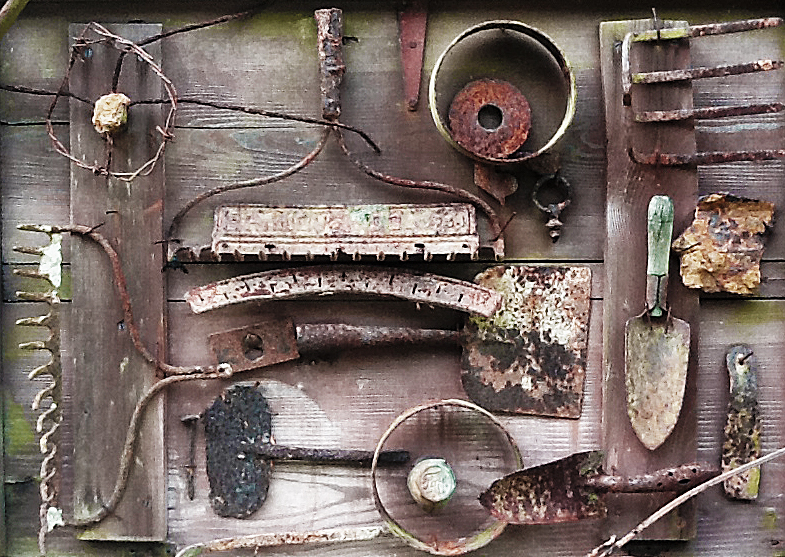 “Objets” I believe worthy of exhibit if only as “barn art” discovered in the dirt here at Stagfield. Why? Because they earned it.